Born and raised in Western New York, Mistress Susan found her way to the Leather/SM lifestyle through the clubs of New York in the early 80’s. She has lived in the Caribbean, California, on the US highways, in the mountains of North Carolina for the last 18 years, and recently returned to the Rochester, NY area. Mistress Susan is the proud and happy owner of slave teagan. Over the years, Mistress Susan has served on the boards of several nonprofit and political organizations. She has worked in sound-reinforcement, radio, hotel management, eral estate and managed a meditation-based retreat center in the NC Mountains. She was a co-founder of MDG and a Leather women’s group in Asheville, NC and MAsT: Upstate NY. She presents on Master/slave dynamics throughout the US and Canada and believes in being a positive resource for the Community. Mistress Susan and slave teagan were honored with the title of Southeast Master and slave 2006, and International Master and slave 2006. Mistress Susan holds true to the core values of honor, integrity, and a sense of duty. These core values help to guide and direct her in life, and in her Mastery. Her S/M interests include various forms of restraining, whacking, poking, cutting, and umm…decorating. 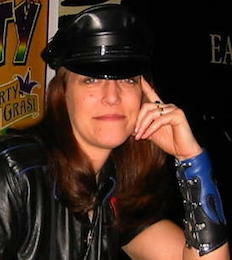 Mistress Susan is committed to honoring Leather traditions and the practice of ethical Mastery.